Many adult children from Cleveland, Ohio, to Youngstown, Ohio, have switched roles with their parents and become their caretakers. If they are trying to avoid moving their parents to a nursing home, calling Access Solutions, Inc. can be the first step to allowing them the freedom of barrier-free living. When people who are having ambulatory issues require an alternative to climbing stairs, calling this local stairlift company can open up a whole new world of home mobility solutions, from affordable custom stairlifts and vertical platform lifts to elevators and access ramps. Access Solutions, Inc. is aware that each person’s situation is unique and can use their 50 years’ combined experience to assist matching the specific indoor or outdoor, curved or straight stairlift that will fit anyone’s situation. Anyone in North Canton, Ohio, and all Northeast Ohio looking for compassionate, detailed, and affordable stairlift installation will be happy with what they discover at Access Solutions, Inc.
Access Solutions, Inc. has a wide selection of home mobility solutions in their expansive showroom that anyone can test so that they are more aware of their options. This veteran-owned company is dedicated to allowing anyone in Northeast Ohio the possibility of barrier-free living, because they know how difficult it is to stay upbeat and positive when someone can’t even move around freely in their own home. It is also difficult for their children to see them in the state of declining health, causing many to research how to avoid moving their parent to a nursing home. With the exorbitant costs involved in relocating to an assisted living facility, the numbers show that it’s more beneficial financially and emotionally to make improvements to the home that they have lived in and with which they are familiar. Access Solutions, Inc. offers an alternative to climbing stairs with their affordable custom indoor and outdoor stairlifts. They are a simple, safe alternative that requires no dramatic changes to a home’s structure. 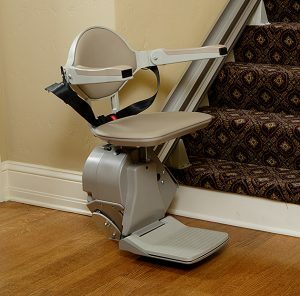 Anyone from North Canton to Cleveland will be amazed at the affordable stairlift options with installation that Access Solutions, Inc. offers for a variety of budgets and situations. Most stairlifts are battery-operated, which allows continued usage during power outages, and include standard features like a swivel seat, wireless remote, automatic charger, and more. This local stairlift company is an authorized dealer for Bruno, Handi-Care, Harmar, and Savaria, and each offers a range of features, whether someone wants to reach an upstairs bedroom or the downstairs laundry. The Bruno Elan is the most popular indoor straight stairlift with its low-profile rail design that leaves plenty of open space on the steps for others. 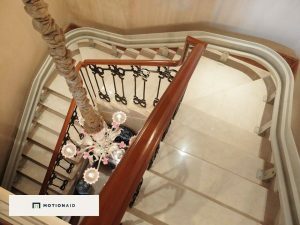 They also carry the Elite indoor straight and curved stairlifts with quality and comfort second to none, adding premium design blends for the home’s décor, a power folding footrest and more. Bruno outdoor stairlifts can allow anyone in Youngstown and beyond to enjoy their outdoor living area or driveway without worry. They are custom made specifically for each staircase for distance, elevation, and unique angles. Access Solutions, Inc. ensures an extensive variety from which clients can choose. 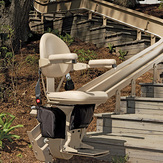 Their Harmar Pinnacle premium stairlift is the slimmest and most light-weight on the market, folding to occupy only 10 ½-inches of staircase width. It features safety sensors and an extremely smooth ride with its helical worm gear drive system. It boasts a 350-pound capacity, but Harmar also carries a heavy-duty version with a 600-pound capacity. Another option is the Savaria K2 indoor straight stairlift with an impressively small fold up size that is out of the way when not in use and is perfect for stair angles greater than 45-degrees. Access Solutions, Inc. can locate any product to fulfill each person’s ambulatory needs. Whether someone in Cleveland, Ohio, would like better access to their driveway with an outdoor curved stairlift or another in North Canton, Ohio, would like to move their bedroom back upstairs, which requires an indoor straight stairlift, Access Solutions, Inc. can supply a wide range of alternatives to climbing stairs. This local stairlift company believes that everyone in Northeast Ohio should be able to enjoy barrier-free living, and their 50 years’ compassionate combined experience has proven this fact. When adult children are trying to avoid moving their parents to a nursing home, Access Solutions, Inc. can provide affordable custom stairlift installations that will improve anyone’s quality of life. Anyone from Youngstown, Ohio, and beyond can visit their showroom to peruse, test, and consult on Access Solutions, Inc.’s vast array of home mobility solutions for emotional and financial peace of mind. This entry was posted in Handicap Modifications, Home Furnishings, Home Improvement and tagged Access Solutions Inc, affordable custom stairlifts North Canton Youngstown Cleveland Northeast Ohio, affordable stairlift installation North Canton Youngstown Cleveland Northeast Ohio, alternative to climbing stairs North Canton Youngstown Cleveland Northeast Ohio, avoid moving parent to nursing home North Canton Youngstown Cleveland Northeast Ohio, barrier-free living North Canton Youngstown Cleveland Northeast Ohio, curved stairlift North Canton Youngstown Cleveland Northeast Ohio, home mobility solutions North Canton Youngstown Cleveland Northeast Ohio, indoor stairlifts North Canton Youngstown Cleveland Northeast Ohio, local stairlift company North Canton Youngstown Cleveland Northeast Ohio, outdoor stairlifts North Canton Youngstown Cleveland Northeast Ohio, straight stairlift North Canton Youngstown Cleveland Northeast Ohio by admin. Bookmark the permalink.